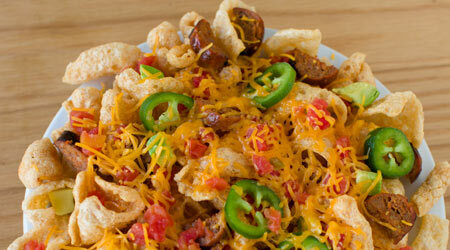 In a skillet, layer Southern Recipe Pork Rinds with shredded beef, black beans, Pico de Gallo and cheddar and pepper jack cheeses. Place in the oven and bake until the cheese is melted. Serve with the toppings of your choice (though we suggest sour cream, jalapeños and guacamole).